Whenever you browse a website or watch a video on a web browser, The browser always downloads the data to its Cache memory first and then it displays it on the browser. So basically if you are watching a youtube video and then you decide to download it to your computer, you don’t have to download it over again. What you can do is, you can open your browsers cache location and copy the video from there. Its as simple as that. But the problem is, you wont be able to identify any file since all the files would be randomly named without any extension details. Fortunately a small utility known as ChromeCacheView will be able to read Chrome’s cache location and list all the files in it for you according to their file types. After this it will be easier for you to identify the files and download them. Using ChromeCacheView is very simple, just run it and the utility will read chrome’s cache location and display all the files in it. If you need to download any of the listed file, simply right click on it and save the selected item to any location on your computer. The next time you need to copy any file from Google Chrome’s cache location, here’s how you can use ChromeCacheView to access Chrome’s cache location and extract any files from it. Step 1: Download and run ChromeCacheView from the link provided at the bottom of this post. 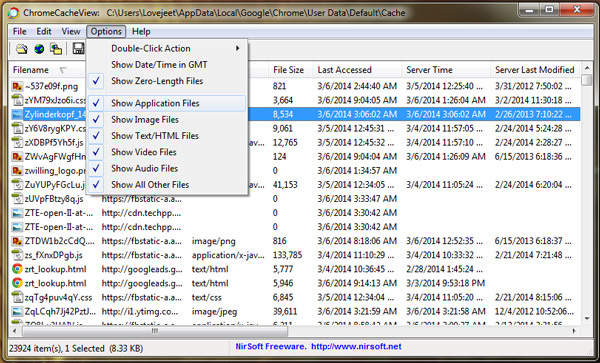 Step 2: By default the utility will display all the files from Chrome’s cache location. If you want to view a particular type of file, Click on Options and uncheck the file types you don’t want to view. Step 3: Select any file and click on the icon as shown in the screenshot below. You would then be prompted to select a folder to save the file. 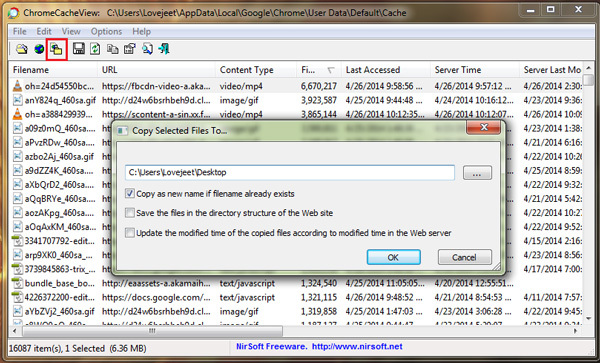 Once you have the file copied from Chrome’s cache location, you would be able to view it. However you should be aware that Google chrome usually clears the cache once you shut down or restart your computer. Overall this is one of the easiest ways by which you can download files, especially online videos which you’ve already watched on your browser and doing so would help you save your internet connections bandwidth as well as your time. 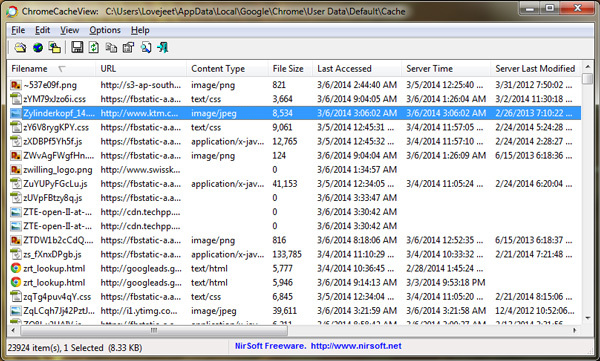 Similarly Nirsoft also provides similar cache viewer utilities for Opera, Firefox and Internet explorer too.